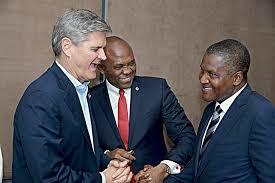 Leading African richest man, investor and industrialist, Alhaji Aliko Dangote and his compatriot, Mr. Tony Elumelu who doubles as the chairman of United Bank for Africa (UBA) Plc, and founder, Tony Elumelu Foundation (TEF), have stressed called for more realistic support the much-needed growth in the African continent by supporting entrepreneurs. According to them, time has come for global organisations and multinational institutions to see Africa as investment destination to fight poverty as African poverty will continue to negatively impact global growth in business. Speaking on the sidelines at the 2018 World Economic Forum that ends today in Davos, Switzerland, both Nigerians averred that Africa remains the best place to invest in modern technology as millions of entrepreneurs are willing to access development supports that will spike global industrial revolution and eradication of poverty. Elumelu made a passionate appeal, saying time has come for global brands and organisations to come together to provide solutions to key challenges negatively impacting African economies. Key areas of concerns according to the chairman of Heirs Holdings include power supply and infrastructural challenges.